We've spent the last week looking at arch bridges across the Los Angeles River. Before that, we looked at arch bridges crossing London's River Thames. I wonder what similarities and differences we can identify between arch bridges in these two cities? Both cities sought to make a more pleasant environment by creating beautiful bridges. In London, They built highly ornate steel (or iron) deck arches. In Los Angeles, its highly ornate, reinforced concrete deck arches. In downtown London, it required five spans to get across the river. In downtown Los Angeles only one or two spans are needed. Los Angeles is in the desert and the river is dry except during the winter. Therefore, the expense of building cofferdams for bridge foundations is avoided. However, both rivers have the potential for flooding and the bridges are built with cutwaters to keep debris from damaging piers. The Los Angeles River often divides rich and poor communities, especially in downtown Los Angeles. I didn't get a sense of that when I was walking along the Thames. The Fourth Street Viaduct was designed by city engineer Merrill Butler and opened in 1930. It is 1837 ft (560 m) long with 25 spans, 70 ft (21 m) wide with five lanes, and it has a single 279 ft (85 m) open spandrel, arch span over the Los Angeles River. The bridge was designed in the Beaux Arts style introduced during the 1893 Chicago World's Fair, a style that was enthusiastically adopted by the City of Los Angeles. 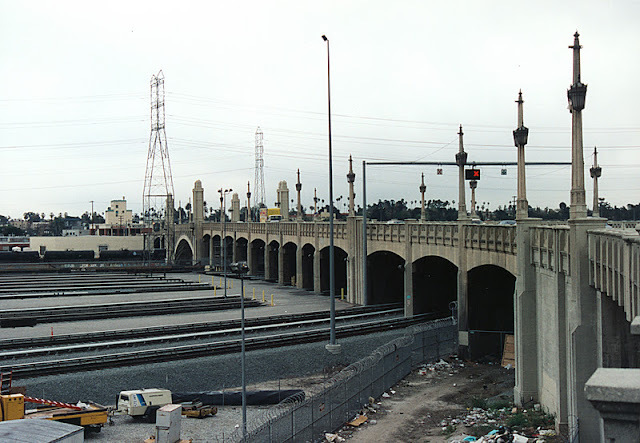 These bridge are along the railway tracks to Union Station and gave visitors the impression that Los Angeles was an affluent and dignified city. Note the familiar use of porticoes at the ends of the arch and the ornate lamps and balusters. Like the other arch river crossings, this bridge was seismically retrofitted in 1995 without impacting its appearance. Los Angeles River Bridges: Fourth Street Viaduct by Mark Yashinsky is licensed under a Creative Commons Attribution-NonCommercial-ShareAlike 3.0 United States License.